Harare - Former Barcelona stars Patrick Kluivert and Edgar Davids joined Zimbabwean President Robert Mugabe on stage at a political rally ahead of a veterans match planned later this year. Davids and Kluivert were pictured alongside Mugabe, 93, at a youth rally for the ruling ZANU-PF party in the southern town of Gwanda on Saturday, in what local media described as a "surprise appearance". Mugabe has ruled Zimbabwe since independence from Britain in 1980, and he is often criticised for brutal repression of his opponents, election rigging and his country's economic collapse. The trip - which comes ahead of national elections next year - was led by Spaniard Rayco Garcia, who previously tried to launch a football academy in Uganda. He said the Barcelona Legends would play in Zimbabwe in November. "My job is to bring all the legends of Barcelona here, the likes of Ronaldinho, Rivaldo, Juliano Belletti, Kluivert, Davids... and to play a team of legends from Zimbabwe," Garcia told local press. "I think that is going to give hope to the youth while promoting talent in the country and bringing a piece of Europe to Zimbabwe." The state-owned Herald newspaper on Saturday ran a photo of former Dutch internationals Kluivert and Davids presenting a replica Barcelona shirt with the name "R.G. Mugabe" on it to Vice President Emmerson Mnangagwa. The paper said that Mnangagwa would give the shirt to President Mugabe, along with another shirt for Mugabe's wife Grace, which had the name "Amai" ("Mother") on it. Kluivert was quoted by the Herald - which is seen as a mouthpiece of Mugabe's regime - as saying: "Zimbabwe is a great country, I think that has been ruled very good, but it has a bad (image) in Europe." The three visitors held meetings with Mnangagwa and sports minister Makhosini Hlongwane in the capital Harare on Friday. They also inspected the 60 000-seater Chinese-built National Sports Stadium where the veterans game is scheduled to be held. "I am sure we will need screens outside the stadium," Mnangagwa said, according to the Herald. "The fact that you are honouring our President Mugabe by giving him your own jerseys is something extremely important." The privately-owned Standard newspaper, which printed a picture of the trio with Mugabe, said they had made a brief appearance at the rally on Saturday after attending the opening of a local community information centre. They also plan to set up a training foundation for young players in Zimbabwe. Mugabe, who is in increasingly frail health, is due to stand in 2019 elections that could see him hold onto power until he is nearly 100. His ZANU-PF party has been accused of routinely using violence, intimidation and fraud to ensure Mugabe's election victories. 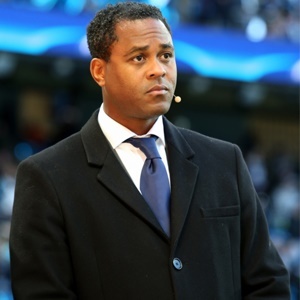 Davids and Kluivert both started their careers at Ajax and also appeared for AC Milan among other teams. Zimbabwe sit at a lowly 101st in the world rankings, but several players play in Europe including captain Knowledge Musona at Oostende in Belgium and defender Costa Nhamoninesu at Czechs Sparta Prague.